Come and visit a fun place full of fanfiction, games and so much more. Looking for an old story? We have the archive of Boardello and soon to be added DAS. Want to chat with your favorite Author? Then this is the place to be. Do you have an Author that you think is great for a chat then let us know too. Come and check out this fun place and join our big Roswell family. Last edited by mmcherron on Thu Apr 16, 2009 8:28 pm, edited 4 times in total. Come Join us in April!!! 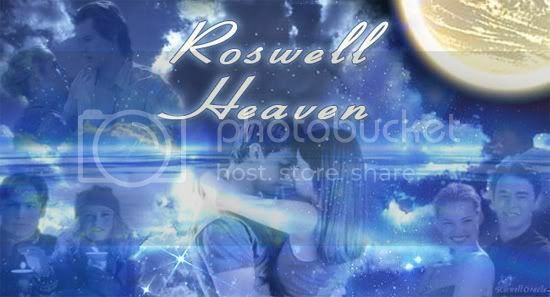 Once again it is time for Roswell Heaven's Celestial Awards. Be sure to look for the thread in the News & Announcement forum to see all the rules and sign up to start nominations!!! We are extending the Nominations until April 30th, so hurry and get posting so your favorite story don't get left out of the awards!!! The Spring Writing Challenges, the Vilondra Project and the Not of This Earth are now up! You have until the end of April to submit stories. Come check them out, and sign up! I second this post, it's a great place and more people should come on over and check it out. We should do more author chats. Roswell Heaven Celestial Fanfiction Awards Nominations! !